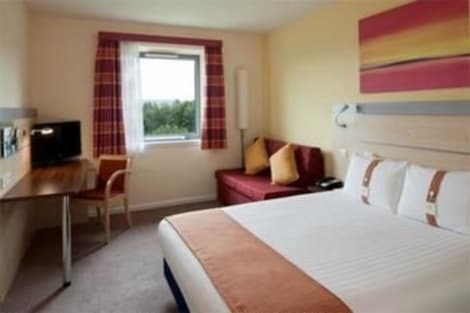 Welcoming central Burnley hotel with free parkingHoliday Inn Express® Burnley M65, Jct.10 hotel is right off the M65 motorway and a short drive or bus ride from the town centre.Catch direct trains to Preston and Blackpool from Burnley Barracks station, a short walk from the hotel. Trains to Manchester leave from Burnley Manchester Road station, a six-minute drive. The hotel offers the convenience of free on-site parking. Watch Burnley F.C. in action at nearby Turf Moor stadium, or cheer on the local rugby team at Burnley Rugby Union Football Club. Haydock Park racecourse is a 40-minute drive away, and you can browse for deals at Boundary Mill Stores. Nearby business parks include Network 65, Altham and Lomeshaye. The hotel's 4 state-of-the-art meeting rooms and Business Centre make it easy for you to host events on site.At this hotel you can enjoy:- Free Wi-Fi- Free on-site parking with electrical car charge points- Express Start™ Breakfast included in the room rate- All Day Dining- Blackout curtains for a restful sleepComfortable rooms include invigorating power showers. Some rooms come with sofa beds, handy if you're travelling with kids. After a busy day, tuck into a bistro-style dinner in the Great Room, or relax on the outdoor terrace with a drink from the bar. Make yourself at home in one of the 50 guestrooms. Complimentary wireless Internet access keeps you connected, and satellite programming is available for your entertainment. Private bathrooms have complimentary toiletries and hair dryers. Conveniences include phones, as well as desks and complimentary newspapers. The Lancashire market town of Burnley lies less than an hour from the heart of Manchester and is surrounded by wonderful scenery. It has a strong culture and arts scene, and is a haven for anyone who loves the outdoors. More than two million people visit the town each year, making full use of the numerous Burnley hotels, restaurants and attractions nearby. Pay a visit to the Queen Street Textile Museum to gain a greater understanding of the history of Burnley and discover how the textile industry helped to shape the town. From the museum you can follow the Burnley Heritage Cycle Trail to reach The Weavers' Triangle visitor centre and discover what it was like living in a mill town during the 19th century. Towneley Hall to the south of Burnley was the home of the Towneley family for almost five centuries. Today the council-owned property is a centre for Victorian and pre-Raphaelite art, set within stunning grounds. Perhaps spend an afternoon wandering through Thanet Lee woods, where a fascinating sculpture trail awaits. Learn all about what goes into making the perfect pint at Moorhouse's Brewery or perhaps work off a night out at Rossendale Valley Sailing Club, where you can try your hand at windsurfing, kayaking, orienteering and mountain biking. Outdoor Elements is another activity centre, set within a seven-acre woodland site that's focussed around a high ropes course. For a less strenuous day, consider a visit to The Woodland Spa at Crow Wood. Here you'll be able to relax in the centre's steam room and hydrotherapy pool, try a Roman foot bath and soak in the 'indoor to outdoor' infinity pool. The wide selection of Burnley hotels and restaurants available means you'll be spoilt for choice when it comes to dining out in the town. Bistro 197 is a family-run restaurant specialising in European cuisine, while The Ram Inn is a traditional country pub offering a great selection of seasonal dishes. Enjoy a memorable fine dining experience by booking a SEOSITE_LEVEL_DESCRIPTION at Bertrams at Crow Wood, or visit Nino's country restaurant to sample traditional Italian dishes and take in stunning views over to Pendle Hill.